On November 17, some forty-odd people gathered outside an egg processing facility in Lansing, Illinois, shouting “Si se puede!,” eclipsing the din of traffic from the nearby Kingery Expressway. They were there with workers’ center Arise Chicago and the United Food and Commercial Workers International Union (UFCW) to protest poor working conditions and their unlawful termination from the facility just a few weeks before. In addition, the former employees of Michael Foods, the company which had recently acquired the facility, were hoping for formalized representation in a union and rallying for the next day’s union election. The egg processing facility, south of Chicago’s city limits but just north of 175th Street, was the headquarters of National Pasteurized Eggs, which produced Davidson’s Safest Choice, and employed one hundred workers from the area before it was acquired by Michael Foods in October. Shortly following the ownership transition, on October 17, workers staged a walkout to protest poor working conditions and sexual harassment claims. The next day, Lansing workers called on Arise Chicago, an interfaith workers’ center, for support as they began the process of unionizing. On November 7, a couple of weeks after employees had returned to work, Michael Foods did not allow the workers who had walked out to enter the facility and hired the security firm AFIMAC to enforce an official lock-out. In the days following, these employees received notice of their termination in the mail. The workers have since been replaced through the NEXUS Employment Solution agency in Highland, Indiana. According to Jorge Mújica, Arise’s Strategic Campaigns Organizer, workers were informed that they would have fifteen days to train the new hires. According to Mújica, “pretty much everybody” was fired. Jesus Soto, former Michael Foods employee, believes that the decision to unilaterally fire Mexican immigrants was a discriminatory decision. “Because we don’t know the language, they think we don’t know the law,” Soto said. Adam Kader, director of the Worker Center at Arise Chicago, said that the walkout was within the range of lawful protest by the Lansing facility employees, but that it can still be difficult to get corporations to care about adhering to labor laws without official union representation. Though the Michael Foods workers could continue to informally represent themselves, Kader says the union offers better protection against a national corporation. “We help workers regardless of whether they’re in a union or not. But the best protection is a union,” Kader said. Besides their termination, workers have made claims of illegal actions and management by Michael Foods staff and policy. Their complaints include unsafe working conditions, unequal pay for women, sexual harassment, and shifts lasting as long as twenty-seven hours. In the time following their acquisition of the brand boasting “Safest Choice,” Michael Foods has put at least one worker in severe danger due to poor, and possibly illegal, management. According to Mújica, on October 20, three days after the walkout, a supervisor asked a worker to operate machinery for which he was untrained. Though he first refused, the worker eventually followed orders and ended up getting his hand caught in the machine. Employees were unable to free his hand and called the fire department to dismantle the machine. Mújica says this was an exception to the norm—Michael Foods’s response to most workplace accidents was to tell workers to call family members for help. 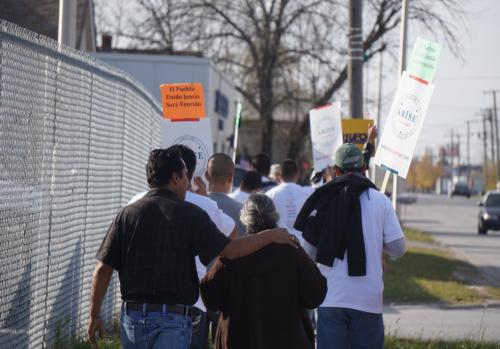 In the month leading up to November 18, the day that the National Labor Relations Board designated for the Michael Foods’s Union Election, demonstrations were held across Lansing to protest the changes that have taken place at the facility in the new fiscal year. On November 15, protesters attended their village board meeting to request that the city of Lansing hold businesses accountable for the alleged retaliation against unionization efforts. Though the village board has issued no official support, the people of the community and the county have been supportive of the protest. With the help of Arise Chicago, the workers have letters of signed support from seventy-two religious leaders from all over Cook County. The number of supportive honks from passing cars on November 17 was no small sign of solidarity either, with each one bringing a small and hopeful cheer from the protesters on site. At the time of the protest, Mújica said that a “huge, huge majority” of workers supported the protest and unionization, estimating that “105 out of 130, more and less…two-thirds” were engaging in the fight for their rights as workers. “All workers are allowed to vote, regardless of the lock-out, so we’ll just wait for the results, and that’s what we’ll do,” Mújica said. The union candidate was Local 881, one of the largest affiliates of United Food and Commercial Workers International Union (UFCW). Eduardo Victoria, an organizer with Local 881 UFCW, was hopeful about the election results. “We believe in the workers. We cover the workers. And we’re gonna win,” he said. In the meantime, most of Michael Foods’s former employees have had to find work elsewhere. “Two weeks of lock-out really damaged their economies,” Mújica wrote. But that does not mean their fight ends, as a few workers are suing the company for missing vacation days, wage discrepancies, and sexual harassment. Michael Foods is one of four subsidiaries of Post Holdings, Inc. Post Holdings was a spinoff of Ralcorp Holdings, a company merged with Kraft General Foods. Michael Foods was formed in 1987, itself a spinoff of North Star Universal, and includes Papetti’s, Crystal Farms, AllWhites, and Simply Potatoes brands in addition to their recent acquisition of National Pasteurized Eggs. At press time, representatives from Michael Foods had not responded to requests for comment. This story will be updated when the Weekly receives a response. Terrific reporting on a largely invisible but important struggle. Thanks to SSW for the work it does. Aside from inconvenienceing me as I by there products, I’m appalled by the companies behavior. I have emailed them to lett them know where I stand. Just let the workers Unionize. No mater what state they operate in the workers may still try to form a Union.